... since I started to use Mech-Q Piping software there has been a big increase in my output. I had found Mech-Q Piping is very easy to use and is a great product. We are happy to announce the release of AViCAD 2019 last summer. We also expect a new AViCAD 2020 version to be completed in June 2019. More to come, so stay tuned! This will be our best release yet that contains hundreds of speed and performance improvements with true Windows 64 bit processing. Buy a lifetime license or ask us about our subscription options for as low as $49 per month. 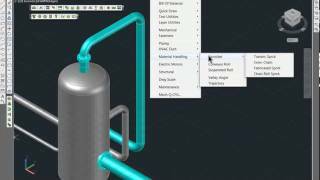 AViCAD is collection of tools to help you become productive with CAD. It contains engineering, architectural, collaboration tools and a massive block library. AViCAD also includes full 2D/3D CAD software and is based on the same commands found in AutoCAD, costing you thousands more. Mech-Q 4 just released too! We are also happy to announce the new release of Mech-Q 4 or what we call MQ4.. Versions for both AutoCAD Full are available for download. IntelliCAD versions are also available. If you have purchase Mech-Q recently within the last 60 days of it’s release you will be eligible for a free download. Other recent updates have also occurred over the last couple of years including a new standalone Mech-Q CAD Software called AViCAD. The four primary tools in Mech-Q are Mech-Q Piping, Mech-Q HVAC and Mech-Q Structural. Additional configurations and bundles are available including a Network Module and Site Licensing. Read more recent Mech-Q news or view the sidebar to the left of this page. Contact us if you have any questions about Mech-Q or AViCAD.